ANDERSON, Ind. (AP) — Vice President Mike Pence went home to Indiana on Friday to pressure the state’s lone Democratic senator to support a GOP tax overhaul. He’ll bounce to Alabama on Monday, campaigning for President Donald Trump’s pick in a special Senate election. And by Thursday, he’s scheduled to be in Milwaukee, headlining a $35,000-per-couple fundraiser. Such is life for Pence, Trump’s political utility player, whose services are increasingly in demand as Republicans brace for a Democratic onslaught in the 2018 elections. Pence is planning a torrent of campaign events across the county in the coming months, aiming to raise money for Trump’s re-election, reward incumbents for tough votes and help former colleagues from his 12-years in Congress. It’s a push that plays to the vice president’s sharpened skills and is also likely to bolster a political network that could serve him for years to come. A former talk radio host, congressman and Indiana governor, Pence has had plenty of time to hone his skills. He’s known to be adept at sizing up a room, knowing what message will play well and sticking to it. Pence, who once joked that he was “tea party before it was cool,” helps put GOP skeptics at ease. The response was typical for a man who defaults to sunny optimism — mimicking his political idol, former President Ronald Reagan — while sometimes steering clear of inconvenient facts. 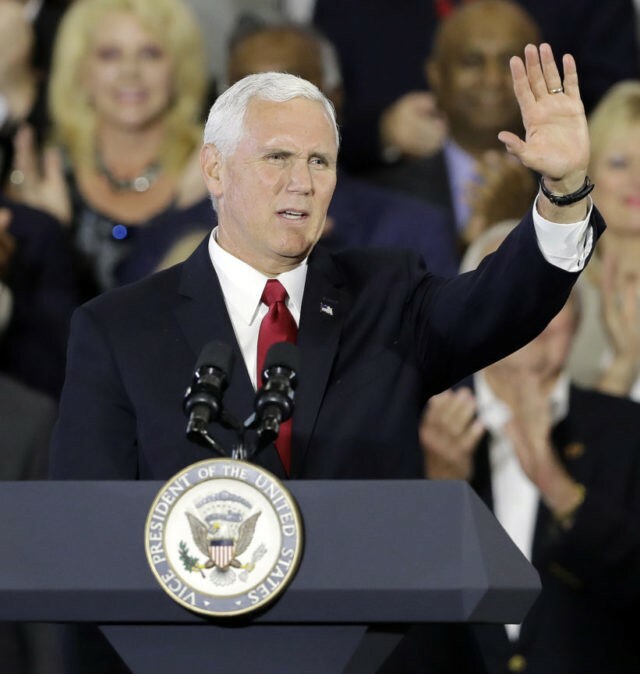 For some Republicans, particularly conventional party stalwarts, Pence has been a reassuring presence in unpredictable times. In June, he helped draw more than 1,400 to Iowa Sen. Joni Ernst’s annual fundraiser. In May, Pence formed a leadership PAC to raise money for Trump’s re-election and for other Republican candidates, aiming to capitalize on his deep ties to party activists and donors. “He has cultivated a fundraising network over a long span of time that is very loyal to him,” said John Hammond III, Indiana’s committeeman on the Republican National Committee. Pence has maintained relationships with Trump loyalists during dinners at his Naval Observatory residence and in fundraisers around the country that are already preparing for Trump’s 2020 re-election campaign. The vice president is scheduled to headline a $35,000-per-couple dinner in Milwaukee on Thursday that will benefit a joint fundraising committee set up to help Trump’s re-election efforts and also feature RNC chairwoman Ronna Romney McDaniel and RNC finance chairman Steve Wynn. Second lady Karen Pence appeared with Gillespie at a “Women for Ed” fundraising reception in Fairfax Station, Virginia, on Monday night, her first political event since the inauguration. The Pences have been friends with Gillespie and his wife, Cathy, since the candidate was RNC chairman and a top aide to President George W. Bush. An adviser to the second lady said she attended the fundraiser because of her personal friendship with the couple and “was open to being supportive” of Republicans on the ballot in 2018 “however she can be.” The adviser spoke on condition of anonymity to discuss internal deliberations. Thomas reported from Washington. Associated Press writer Tom Beaumont in Des Moines, Iowa, contributed to this report.